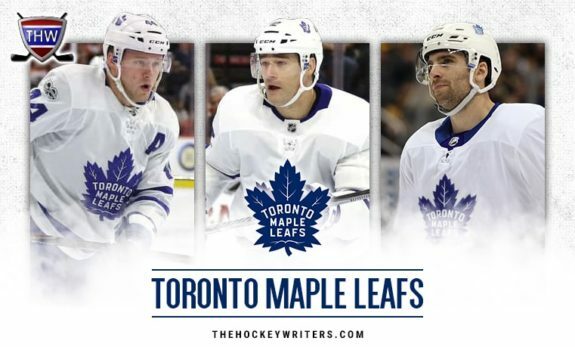 Maple Leafs on a Roll: Marner, Rielly, Marleau, Johnsson...and Nylander? Maple Leafs on a Roll: Marner, Rielly, Marleau, Johnsson…and Nylander? 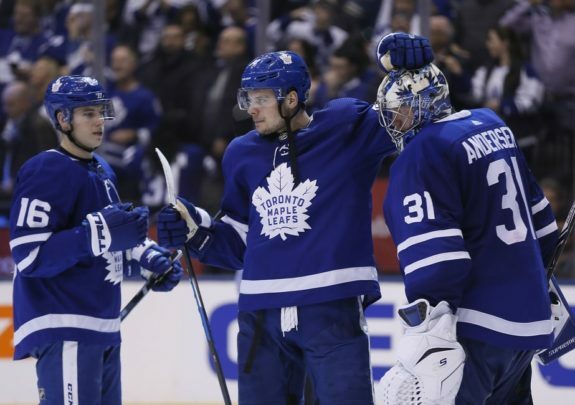 Saturday night’s victory over the New York Rangers was the Toronto Maple Leafs’ third in a row. This game was a bit closer than the previous two, but emerging NHL star Mitch Marner scored twice in the third period to cement the Maple Leafs’ 5-3 win over the Rangers. Marner is fast becoming one of THE leaders of this (mostly) young Maple Leafs’ team. What did we learn about the Maple Leafs’ players from this third-straight victory? Mitch Marner scored twice during a high-scoring third period where the two teams combined for six goals. After the Rangers’ Chris Kreider scored to make it a one-goal Maple Leafs lead, Marner’s empty-netter with 20 seconds left ended the threat. Earlier in the third period, Marner scored to put the Leafs up 4-2. Marner might have had three goals, but one shot hit Andreas Johnsson before it bounced into the net. Marner, who throughout his career has been seen as a pass-first player, has defied script by scoring six goals in his past four games. He now has 12 goals on the season, which is well on pace to break his previous career high of 22 goals. It might also ruin his reputation as a goal-producer rather than a goal-scorer. Are 100 points out of reach? Morgan Rielly is on a scoring streak, and this game didn’t slow that streak down. He contributed a goal and an assist. Rielly, who two days ago I touted for Norris Trophy consideration, now leads all NHL defensemen with 42 points. He has 30 assists before Christmas and has scored nine points in his past four games. Are 90 points out of reach? His 12th goal of the season put him three over his career high. In fact, those 12 goals in 2018-19 equal his total for 2016-17 and 2017-18 combined. He also increased his lead as the NHL’s highest-scoring defencemen. When Zach Hyman went down in New Jersey with an ankle sprain, Johnsson was put on the Maple Leafs’ top line with Marner and Tavares. Johnsson scored a goal and had two assists – John Tavares, who might be on a 50-goal pace, also had two assists. Johnsson’s goal early in the third period was first given to Marner but Marner’s shot actually deflected off Johnsson, who was standing in the right spot at the right time and the shot – or bounce – or whatever – beat Georgiev. Georgiev, who was strong in Tuesday’s win over the Anaheim Ducks, was also good tonight but could only stop 31 of 35 Maple Leafs’ shots. Once again, Patrick Marleau made history – which he seems to do every game. In this game, the 39-year-old Marleau became the fourth player in NHL history to register at least 10 goals in 21 or more seasons straight. Jake Gardiner played more minutes than any other Maple Leaf (23:03) and was plus-2. While fans endlessly deride Gardiner, obviously head coach Mike Babcock likes him. Sadly, for Tyler Ennis, this win came at a cost. Like Zach Hyman, Ennis left the game with a foot injury. Fortunately, he has extra time to heal over Christmas. I hope he comes back quickly. William Nylander did not find the score sheet. He is struggling to return to form and, at times in this game, he seemed removed from the play. It isn’t the start he was looking for after his holdout. But, as Babcock suggests – or at least did a few games ago – be patient. That said, even Nylander noted earlier this week that his own patience was starting to wear thin. Related: Did Babcock Throw Nylander to the Wolves? The Maple Leafs have a quick turnaround, which is perhaps good for a team on a roll. Tomorrow, they meet the same Detroit Red Wings who beat them in overtime the last time they played. The Red Wings played last night and lost to the Panthers 2-1. The Red Wings are the underdog, but of course, they were earlier in the year as well, and, we know what happened then.